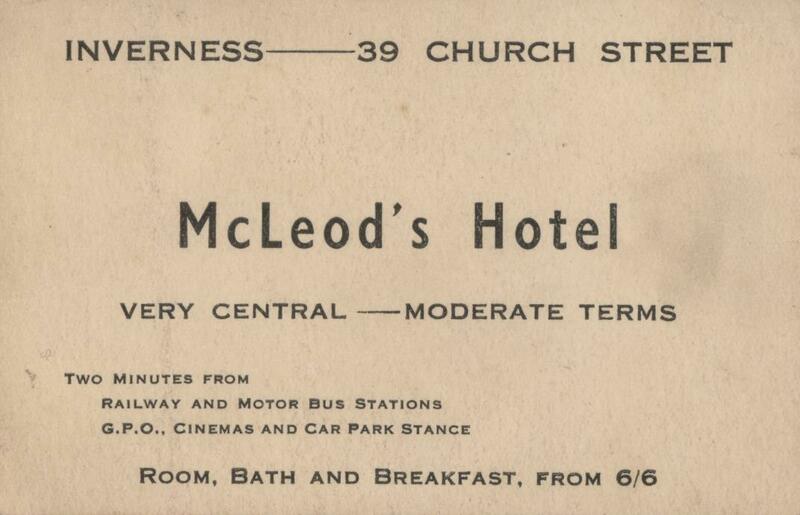 There are quite a few hotels which used to be notable on the old Inverness scene and are now no more - the Douglas (Union Street), the Queensgate, the Royal (Academy Street), the Eastgate, the Albert spring to mind. Any more to add ? The Northern was down Grant's Close. Mac Dougall's Hotel, bottom of Church St. with Hay's furniture shop on one side and School Lane/Coutts newsagents on the other. Mcdougall (clansman) hotel is still there, did it not used be known as the temperance hotel? long before my time mind you! Ah ya beat me to it Charlie, got a call halfway through the post! i have had a pint there once, during our 'have a drink in every licenced premises' phase. But it wasn't a licensed premises, or at least I thought that was their particular "zero tolerance" interpretation of the word Temperance, despite the real meaning being "in moderation" as opposed to the Total Abstinence peddled by the Temperance Movement and the Band of Hope etc. The Bught Hotel which was situated near where the Ice Rink now stands.It used to do good business on Welfare League nights and did a fair number of wedding receptions. Where of course history was made on September 9th 1993 and Caley voted 55-50 and merge with Thistle. Meanwhile across the river in the Rannoch Lodge, Thistle went for it 33-12. The Rannoch Lodge of course became the Crown Court which I think needs to join this thread since it appears to have gone bust and is no longer honouring bookings. The Rannoch/ Crown Court scenario make me think that we should also add to this thread those venerable Inverness Hotels which are still in existence but which have had their names corrupted. One other defunct Inverness Hotel which comes to mind is the Ness Castle which was a pretty dismal establishment about half a mile off the Dores Road where you had to turn left just out past Holm Hill. I'm not surprised it didn't last the pace and it was last heard of converted into rented flats. Very much against my better judgement I went to view one about 4 or 5 years ago and couldn't wait to get out of the place! Wasn't the Thistle Hotel called the Mercury Hotel? Yes, well Mercury Motor Inn actually later changing to the Thistle. Any of the older generation remember this one it was up a close to the north of the old Caley hotel during from about 1940 to early 50's. no Caley Thistle forum discussion would be complete without mentioning the Muirtown Motel ... technically not a 'hotel' but close enough ! I have a copy of the 1962 AA Members Handbook and it lists a few I've never heard of. Bruar, Old Edinburgh Road, Hanover, Ness Bank and Haughdale also Ness Bank. The Haughdale was on Ness Bank, owned by Nicol Manson who also owned the Glen Mhor.